A year ago Barnes & Noble closed the book on its Nook line of tablets, opting to lend the brand out to other manufacturers instead. Now we're seeing the first Android device to capitalize on this idea. Take a guess as to which company decided, sure, I'll make a Nook tablet. That's right, none other than Samsung. When you're already flooding the market with umpteen different tablet variants, what's one more? Dear reader, I present to you the Galaxy Tab 4 Nook. The tablet comes with a customized Nook UI that should in some way prioritize using the device for reading, but the press release doesn't go into details. It emphasizes the amount of Barnes & Noble content available for users to enjoy, and while I'm inclined to point out how any Android user can already view this media on their devices, the pre-existing Nook app is pretty janky, and it has been for quite some time. If the software here is better, it may just be worth a look. And since Barnes & Noble will display the 7-inch slate in stores alongside its current Nook ereaders and tablets, doing so shouldn't be all that difficult. Considering the superb build-quality found in the original Nook Color and the competent versions that launched in subsequent years, the Galaxy Tab 4 NOOK is hardly the same as the bookseller offering up a new model. Samsung's plastics just don't compare. Still, the two companies intend to create multiple co-branded tablets, so look for more of these to pop up somewhere down the line. 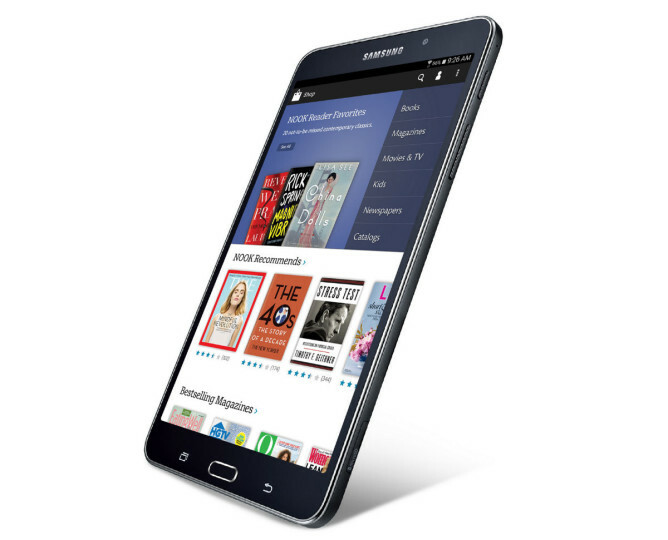 NEW YORK & RIDGEFIELD PARK, N.J.--(BUSINESS WIRE)--Samsung Electronics America and NOOK Media, a subsidiary of Barnes & Noble, Inc. (NYSE:BKS), today announced a partnership to develop co-branded Samsung Galaxy Tab 4 NOOK tablets that feature the award-winning Barnes & Noble digital reading experience. 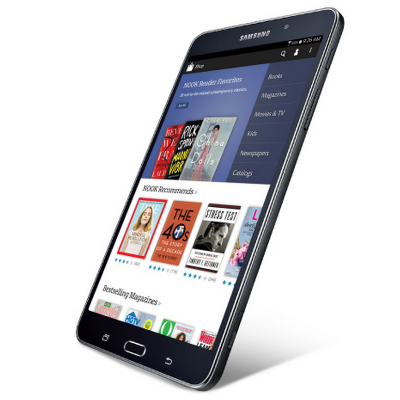 The co-branded devices will combine popular Samsung Galaxy Tab 4 hardware with customized NOOK software to give customers powerful, full-featured tablets that are designed for reading, with easy access to Barnes & Noble’s expansive digital collection of more than three million books, leading magazines and newspapers. The companies are expected to introduce Samsung Galaxy Tab 4 NOOK in a 7-inch version in the U.S. in early August. The co-branded tablets will be prominently displayed along with NOOK eReaders and sold at Barnes & Noble’s nearly 700 bookstores across the U.S. and online at bn.com, one of the leading e-commerce sites. Mr. Huseby noted that the Company will continue to offer its NOOK GlowLight™ and continue to provide customer support for its millions of customers. He added that the partnership is a major milestone in Barnes & Noble’s efforts to rationalize the NOOK business. Working with Samsung on co-branded tablets will allow the Company to reduce its exposure to the substantial cost structure and other financial commitments that accompany ownership of the hardware production aspects of the NOOK tablet business. Going forward, the Company will be able to focus on its proven expertise in acquiring and delivering the best digital reading experience to grow NOOK content sales.